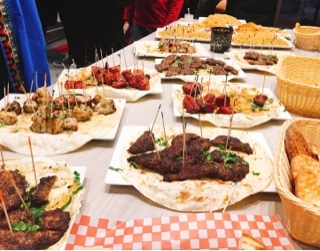 In Toronto, we’re blessed to be able to eat cuisines from so many cultures. 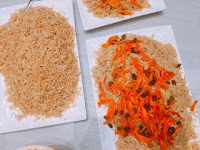 Up until recently, I’ve never experienced Afghan dishes: the spiced meats, herbed yoghurt or fruit studded rice. The tastes are familiar – Persian, Indian, and Middle Eastern – but it’s still unique and the spices balanced and not quite as overwhelming for a virgin palette. 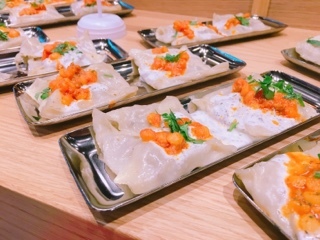 You have to try the mantu (5 for $6.99 or 10 for $10.99), they’re fantastic. Square shaped dumplings filled with sautéed onions and ground beef pinched into an ultra-thin wrapper. Generally, I find dumplings need to be piping hot to be at their peak, however, mantus are topped with a light garlicky yoghurt, stewed split peas and mint making it equally delicious cold. 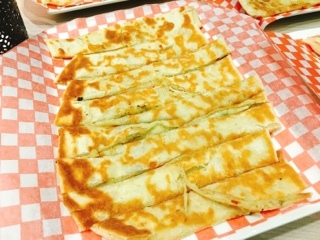 For a heavier appetizer, the bolanee’s ($6.99) potato filling wrapped in a thin pan fried naan will satisfy. The mixture is studded with green onions and herbs, but there’s also a hit of heat that sneaks up on you. Since they don’t use a lot of fats at Naan and Kabob, the bolanee is rather dry; a dip into yogurt or the “magic sauce” really helps. You can’t visit the restaurant without trying their namesake kabobs. 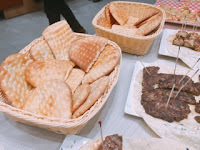 Each is served with salad and fresh naan (more like a thick dry crusty flatbread than the flakey soft Indian counterparts). It’s worth paying the extra $1.50 to add rice, the long grains are perfect for mixing with pieces of meat and the accompanying sauces. For another $1.50 the rice can be topped with qabli, a mixture of re-hydrated raisins and slivered carrots, which keeps the rice moist and adds sweetness. 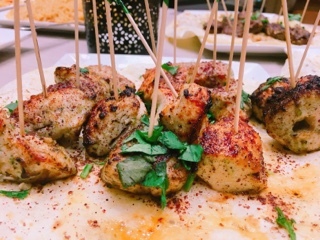 Having tried two pieces of the classic chicken breast kabob ($9.49) throughout the evening, it was a hit or miss. The first piece was the typical dry unappealing chicken – the output of something skinless and boneless. Meanwhile, a later piece was juicy and tender. 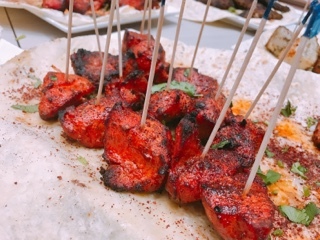 If you’d rather stick with chicken (lamb is a more popular Afghan protein), I’d go with the tandoori breast kabob ($9.99) instead, which was succulent every time having been marinated and cooked at a higher temperature. Moreover, the tandoori spices adds flavour so you don’t need to rely on the hot or magic sauce for taste. 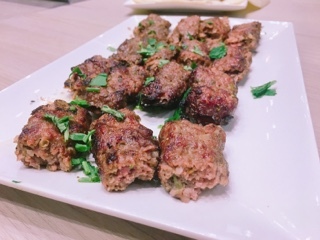 Their shish kabob ($8.40) takes ground beef and a house blend of Afghani herbs and spices then forms it onto skewers before grilling. It’s a tasty combination of seasoning and the sprinkling of lentils (?) put into the meat helps to seal in juices. You can tell the kids that the chaplee ($9.49) are burgers with the naan substituting for the bun. The ground beef patties are more flavourful than the North American version, but also leaner and thoroughly cooked through. Naan and Kabob only has one dessert, a firni ($2.49), but it’s a delicious one. 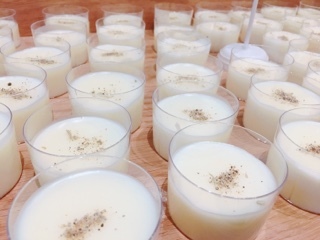 After a heavier meal of rice and meat, it’s nice to end with a lightly sweetened rosewater milk dessert, its texture a cross between pudding and mousse, oh so silky. 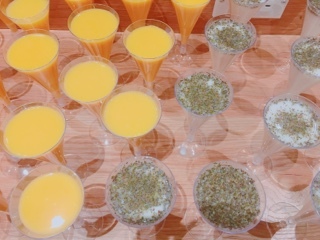 There’s also a mango smoothie ($3.49) available, it’s a thinner consistency that makes it more like juice. For something really different try the doogh ($2.29), a water and yoghurt drink topped with dried mint. It takes some getting used to as the drink is salty, so works better when you’re eating the kabobs. 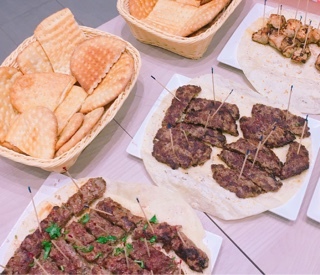 A portion of Naan and Kabob’s proceeds is given to Covenant House. But, they don’t stop at just donating money; the restaurant also provides youth job opportunities so they can get culinary training and develop their skills. A commendable endeavor the four-restaurant chain has implemented to give back to their GTA community.